These fascinating and revelatory books are great companions for people who have received a Unity Bubble. 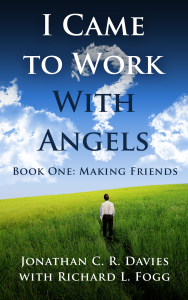 They are: The Universe Project and I Came to Work with Angels - The Trilogy. They are sequential. The Universe Project provides a perspective on Consciousness explaining fundamental principles and how they pertain to our Universe. It defines life-streams, dimensions, Angels, Souls, Creator Gods and people. The Trilogy contains transcriptions of actual conversations with Unity as they happened over a 5 year period. Making Friends tells of the adventure, exploration and discovery through profoundly fascinating conversations with many unseen Higher Beings and Intelligences of our Universe. Making Friends documents the one-on-one relationships developed over many years. Absolutely unique, the scope of this complete work is epic in nature, leading to a possible simple solution to humanity's current situation on Earth. The transcripts continue the "Conversations with Consciousness" theme. We, as humble humans, begin to work with the heavens to address the challenges faced by us all. "A New Direction" unfolds as relationships based on trust and mutual respect grow stronger. Many other intelligences engage, and fresh perspectives are brought to light. We continue the adventure and sense our intended place in creation. Completes the transcripts from April, 2008 until January 1st, 2009. The exploration continues on what became known as "The Big Idea". It documents that journey to the final enactment on New Year's Eve at the stroke of midnight. During this volume the general title of the work is revealed in an “ah-ha” moment!